Not only is this book set in the city I live in, it's also set in my particular neighborhood. So while I was reading, I could picture the people and places the author was describing. And, even though I love Seattle, I was greatly amused by the descriptions of the people and of the idiosyncracies of this city and its residents and thought the author was spot-on. And I could relate to her annoyances in many cases- Bernadette especially is annoyed by things like Seattle's numerous five-way stop signs, and when we pulled up to one today, I burst out laughing. 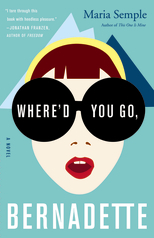 The story in Where'd You Go, Bernadette is told through emails and letters to and from Bernadette and to and from secondary characters in the book. It's a story of trying to find Bernadette- both her internal search for herself and for stability, and later a physical search by her beloved daughter to try to find her after she disappears. The main character, Bernadette, is crazy and funny and sure of herself and totally lost all at the same time. But above all, she loves her daughter and her daughter loves her, no matter how insane and out of control things get. This is definitely a darkly comedic book, but it's well-written and funny, with characters who grow and change in the course of the novel. Overall, a very enjoyable weekend read. a Rafflecopter giveaway Disclosure: I received a copy of this book to review for myself. I was not compensated in any other way and all opinions posted here are mine and mine alone. I would like to win this book for myself. Thanks for having the giveaway. this book would be all for me! I've read it and loved it - would donate it to my local library if I won (I have an ARC). I would like to win this for myself. Thanks for the giveaway! for myself, i love to read! I'd like to win this for me! I'd like to read it but I think my daughter might like it too! Thanks for the chance to win.